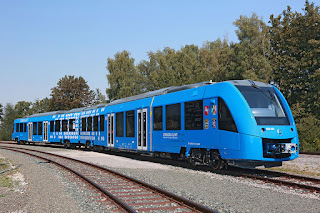 Germany has unveiled a hydrogren-fueled train that it's claiming is zero emissions. It might be! It could especially be progress on the vast majority of American rail lines that aren't currently electrified. But hydrogen is only as clean as the power used to make it, and most of the coverage seems to be ignoring that. Hydrogen fuel isn't mined or collected directly - it's basically a battery loaded with power from other direct fuel sources. If it's solar or wind, it's zero-emissions! If it's coal or oil, you might as well just use coal or oil to power the train. PERSON: It's hydrogen-powered! It's zero emissions! ME: Hydrogren is not a fuel source. It's basically a battery. It's as clean as the power that was used to make the hydrogen fuel. What was used to make the hydrogen? PERSON: Uh, I don't know. ME: So it could be a train powered by coal? Like the first locomotives they had in the 1800s? PERSON: Man, you are depressing AF. “You can’t get to where he wants to be, in his lifetime, without a massive dose of good old-fashioned government intervention,” Pyle said. Republicans don't deny climate science because they don't know the facts or don't trust its scientific rigor. They deny it because all available solutions to global warming contradict their free-market dogma that big business alone can solve all of our problems (with a few government subsidies along the way). The free market hasn't, and can't, solve the climate crisis any more than it solved our smog or dirty water problems - we needed the Clean Air Act and Clean Water Act to do that. But instead of altering their ideology, American conservatives just pretend global warming doesn't exist. After years of trying to pretend the right messaging will trick Republicans into supporting clean energy and climate science, Faison is still beating his head against the wall of denial. Inexplicably, Faison says he may vote for Gary Johnson, who doesn't think we should bother trying to stop global warming. Faison would be better off taking Jon Stewart's advice: "Let's stop pretending that concessions to the right will, at any point, sate the beast." And as the Center for American Progress reports, many of Faison's donations have gone to Republicans with mixed - or flat-out poor - records on climate change. Imagine how much good Faison's $175 million might've done if instead he'd spent that money trying to defeat climate science deniers? A big red flag that's emerged in reports of "tainted" Halloween candy in recent years: People who post to social media before calling police, or who never actually call the police at all. That way you get all the attention, but none of the getting charged with filing a false report! A Halifax, Nova Scotia man says his son cut his thumb on a razor blade hidden in a candy bar. With his son's thumb still bleeding, the man did not clean the wound or put a Band-Aid on it - he took a picture of the bloody thumb and posted it to Twitter. Right after news of the first razor incident broke in Halifax, and more than 12 hours after trick-or-treating ended, a girl in a neighboring town suddenly found a razor in a piece of her candy. A woman in Huntington, TX posted to Facebook that she found a needle in candy, but apparently hasn't called police. Two women in Marysville, WA also took to Facebook to report finding objects in candy. Someone reported finding a razor blade in candy in Manistee, MI. But get this: "Last year, police in the City of Manistee said two children had razor blades hidden in their candy. Police determined that a family member of the victims was behind that incident. The family member had mental-health issues, police said." Very few of the news reports on this year's incident are referencing last year's hoax. A woman in New Jersey reports finding a needle in candy. This incident is not far from last year's Philadelphia suburbs needle-in-candy hoax, though none of this year's local media coverage mentions last year's identical scare turned out to be hoax. Woman in Wisconsin Rapids, WI says her child found a nail in a Tootsie Roll. Ottawa police have already declared one report of tainted candy "unfounded." One Wyoming town apparently got extremely hype for tainted candy & scary clowns. "Rock Springs Police Public Information Officer Alison Deters said as of 10am, the department has received one call about suspicious candy which had liquid on the inside. Officers believe the candy may have had something spilled on it, or it broke during transport." Tainted Halloween candy is almost always a hoax, but that doesn't stop media and police from acting like every needle in candy is CERTAIN ATTEMPTED CHILD MURDER.